One Pillar Pagoda was constructed by Emperor Ly Thai Tong in AD 1049. 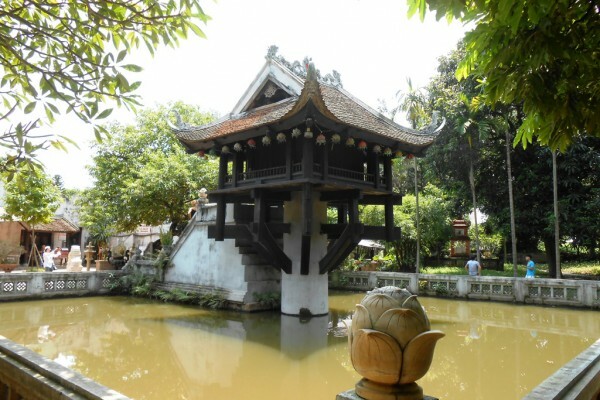 One Pillar Pagoda, situated within the tiny Dien Huu Pagoda, also dating from the 11th century, this wooden pagoda was built, as the name suggests, on a single stone pillar, standing in an elegant lotus pond. One Pillar Pagoda has been damaged and reconstructed on numerous occasions.However, none of these acts of destruction is harder to fathom than its burning by the French in 1954. One Pillar Pagoda is a small pagoda with one pillar in the middle if a lotus pond. If you would like to give birth to a baby soon, visit the One Pillar Pagoda and give your offerings. One Pillar Pagoda or still called Dien Huu Pagoda was built in 1049 under King Ly Thai Tong. According to the history, at the time King Ly Thai Tong was old but he still did not have a son so that he often went to pagodas to pray for that, one night he dreamed Bodhisattva of Mercy who was appeared in a lotus in the square lake to the west of Thang Long citadel, Bodhisattva of Mercy was holding a boy and took it to King Ly Thai Tong. Then, the queen had a boy, base on this King Ly Thai Tong made decision to build One Pillar Pagoda base on the image that he saw in his dream to pray Bodhisattva of Mercy. Also according to the history, One Pillar Pagoda was built in 1049 and it was repaired in 1105. This is a creative architectural project include the stone sculpture, painting, the water face is the cultural symbol, the special art….One Pillar Pagoda was destroyed and it was re-built by the smaller size comparing originally. This is a really special architectural complex. Now a day, everyday there are a lot of the domestic and foreign tourists arriving to pray and visit at One Pillar Pagoda. This special pagoda was chosen as one of the symbol of Hanoi capital. One Pillar Pagoda is located in Ho Chi Minh Complex, this destination must be included in the city tour of Hanoi, the tourist should not miss this special destination on your trip to Hanoi, Vietnam. From One Pillar Pagoda you also visit a lot of another famous features such as Ho Chi Minh Stilt House, Ho Chi Minh Museum, Ho Chi Minh Mausoleum, Tran Quoc Pagoda, Temple of Literature….all of these places are the most features of Hanoi.